Other information parent line The K173cl1 is a cloned laboratory line of the K173 strain of P. berghei that lacks gametocyte production and sequestration of schizonts. The absence gametocyte production and schizont-sequestration can most likely be explained by the laboratory history of this line; it has been kept for more than 20 years in mice by mechanical blood passage; its chromosomes are reduced in size as a result of the loss of subtelomeric genes and repeat elements (PubMed: PMID: 2674047; 2649389). This line has frequently been used to study P. berghei ECM (PubMed: PMID: 2230643; 9806067). Asexual blood stage GFP-Luciferase expression in mature schizonts and young ring forms. The mutant expresses GFP-luciferase under the control of the schizont-specific ama-1 promoter. 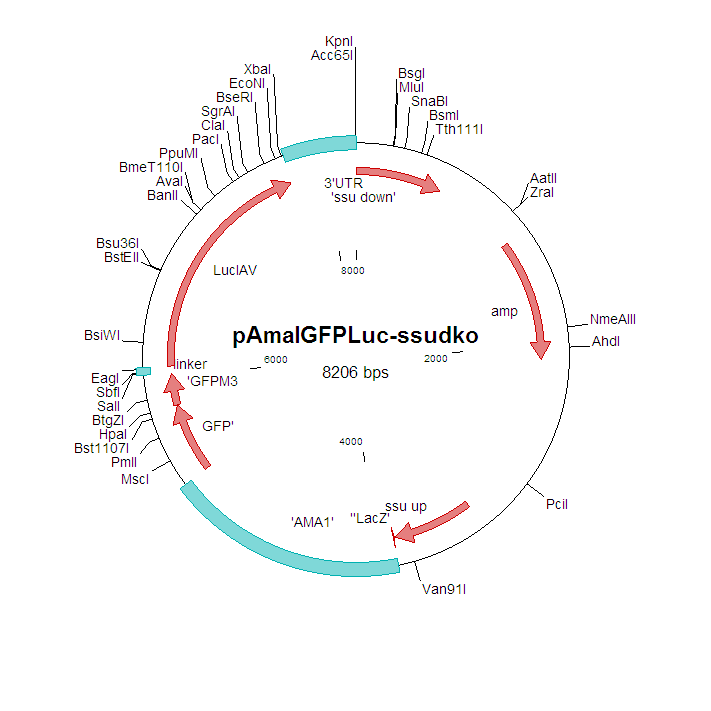 The gfp-luc gene has been integrated into the c/d-ssu-rRNA unit by double cross-over homologous recombination. The mutant has been selected by flow sorting (FACS) and does not contain a drug-selectable marker. GFP-Luciferase is expressed in maturing schizonts and is still present in young ring forms (0-4 hours after invasion), carried over from the schizonts. The mutant is generated into the K173cl1 parent line of P. berghei. This line is a cloned laboratory line of the K173 strain of P. berghei that lacks gametocyte production and sequestration of schizonts. The absence gametocyte production and schizont-sequestration can most likely be explained by the laboratory history of this line; it has been kept for more than 20 years in mice by mechanical blood passage; its chromosomes are reduced in size as a result of the loss of subtelomeric genes and repeat elements (PubMed: PMID: 2674047; 2649389). This line has frequently been used to study P. berghei ECM (PubMed: PMID: 2230643; 9806067). RMgm-380: This mutant, generated into the K173cl1 parent line of P. berghei, expresses Luciferase under the control of the constitutive eef1a promoter. RMgm-375: An independent mutant, generated into the K173cl1 parent line of P. berghei, expressing GFP-Luciferase under the control of the constitutive ama-1 promoter. The gfp-luc gene has been integrated into the c/d-ssu-rRNA unit by single cross-over homologous recombination and in this mutant multiple copies (2-3) of the GFP-Luciferase gene are integrated. The mutant contains the tgdhfr selectable marker.